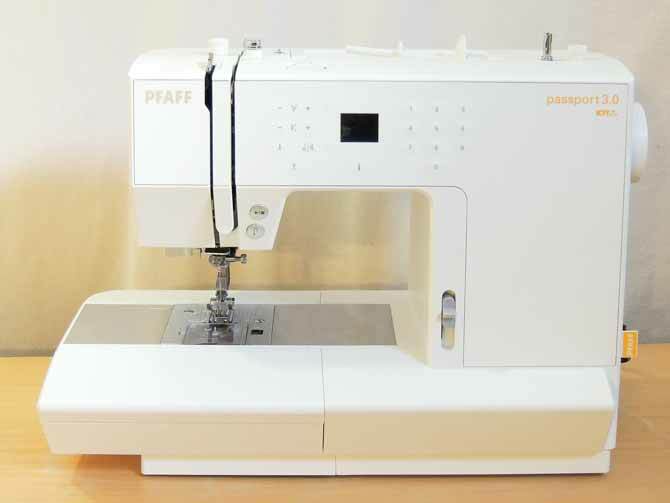 With spring buried deep beneath my snowbanks, I’m still stitching away indoors with PFAFF’s passport 3.0. In yesterday’s post I created a lucky pincushion using PFAFF’s passport 3.0. 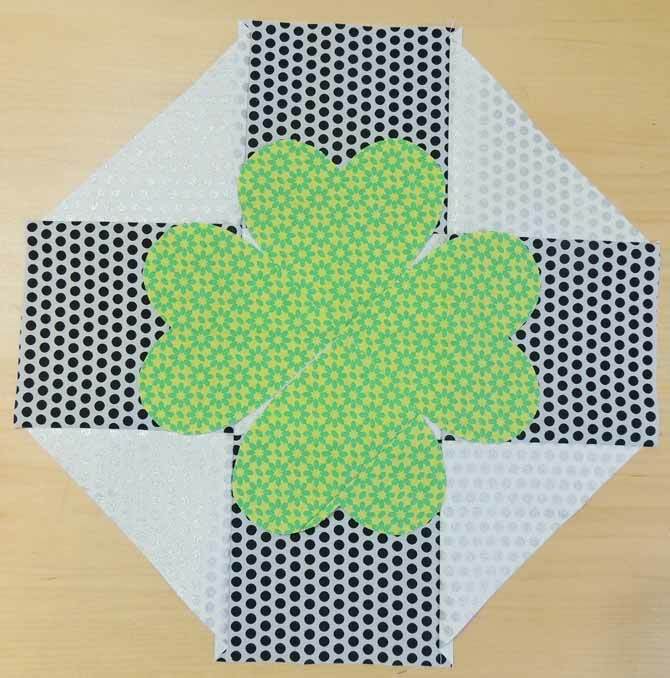 Today I thought I’d keep the luck rolling and add a table topper to my decor – decorated with a lucky four leaf clover, of course! I wanted to make this table topper the easiest way I could think of, so of course precut fabrics came right to mind. I didn’t have a charm pack on hand, so I decided to make my own charms from my stash. But instead of using lots of different fabrics for the background, I chose to cut my charms from two fabrics. Then I picked a fun, bright green to make my four leaf clover look happy and lucky! 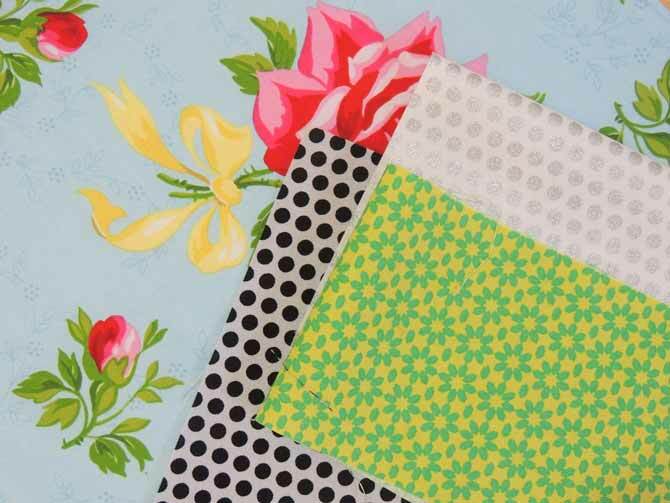 one fat quarter for backing – choose a backing fabric with a different theme to make it reversible for use on several occasions. 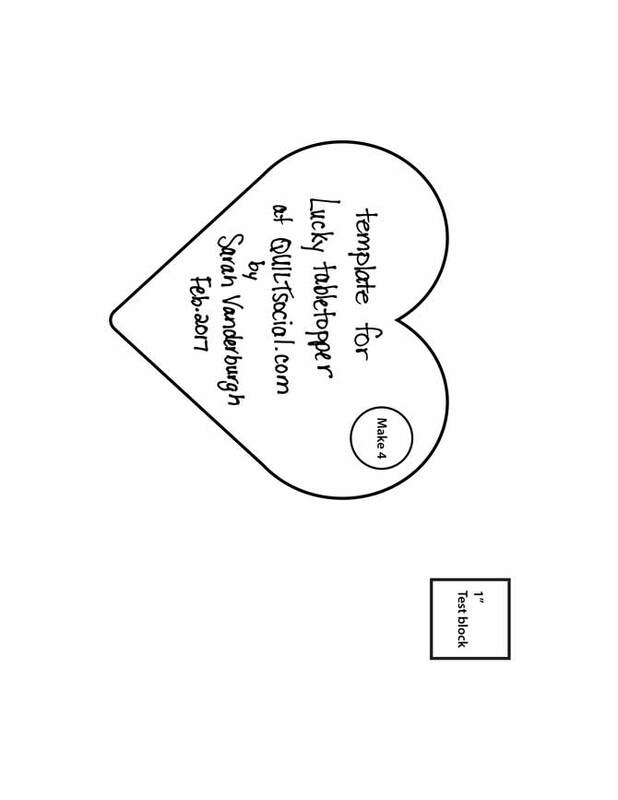 To make my hearts I cut out a heart template from a 5″ square of paper. I folded the paper on the diagonal and cut out my shape. 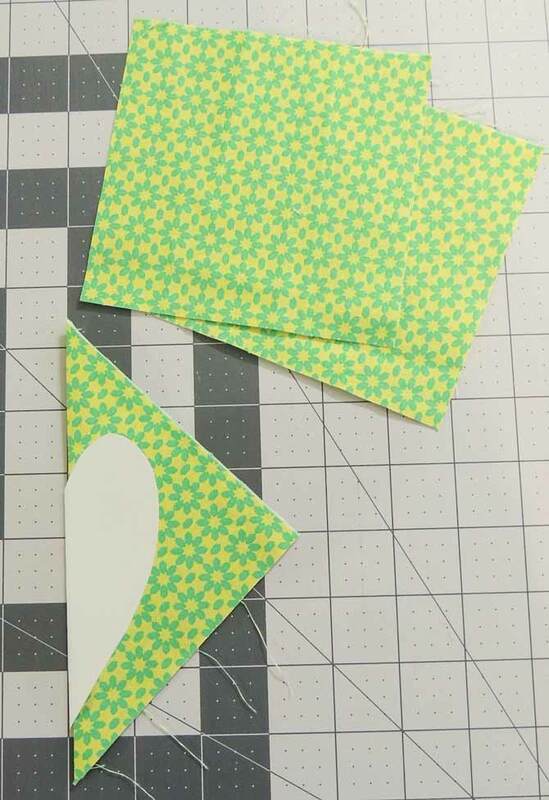 Then I folded one 5″ green charm in half on the diagonal and tucked it inside the paper template and cut it out. I repeated these steps with the three remaining charms to make a total of 4 green heart. 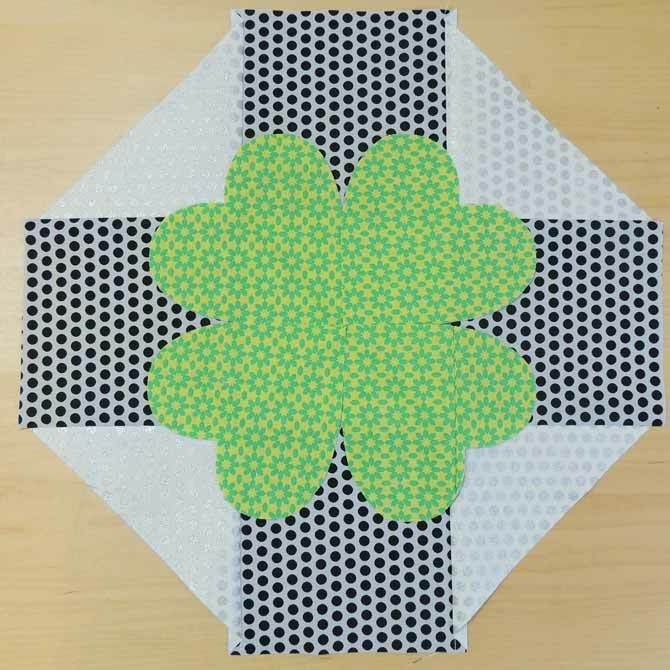 Cut two of the charm squares in half on the diagonal once – they’ll be the diagonal sides of the topper. If you’re using two different fabrics, alternate them in your layout. See the photo below for the layout that I used for my topper. If you’re using a variety of charms, move them around until you’re happy with the arrangement remembering that the middle one won’t really be seen. 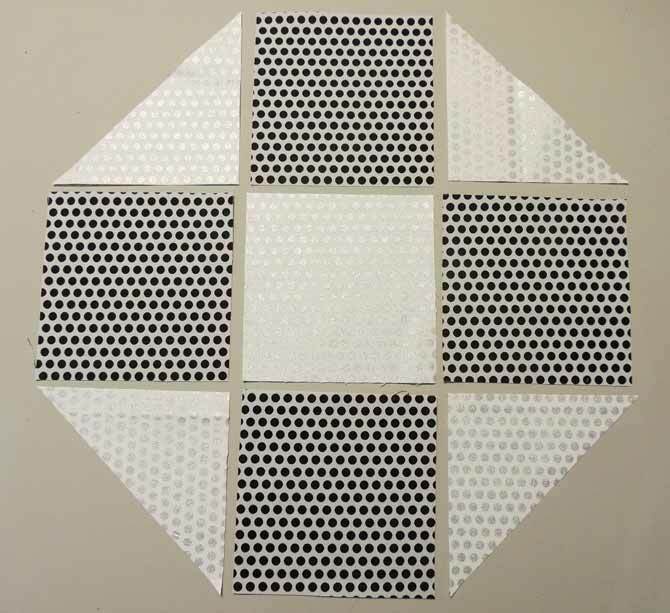 Sew the charms together into rows, pressing the diagonal ends towards the center square on the top and bottom rows. On the middle row, press the seams away from the middle charm. Next, sew the rows together. 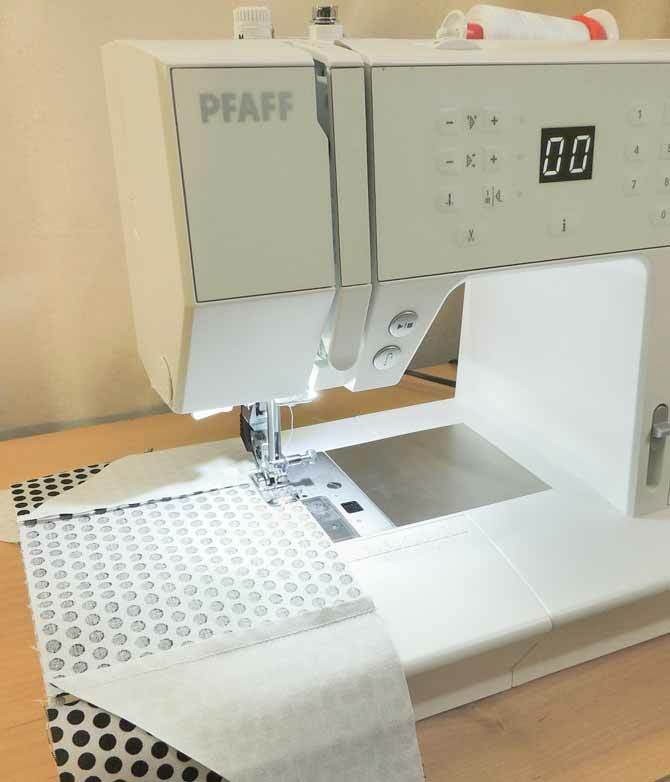 This is where I really appreciate the PFAFF passport 3.0. 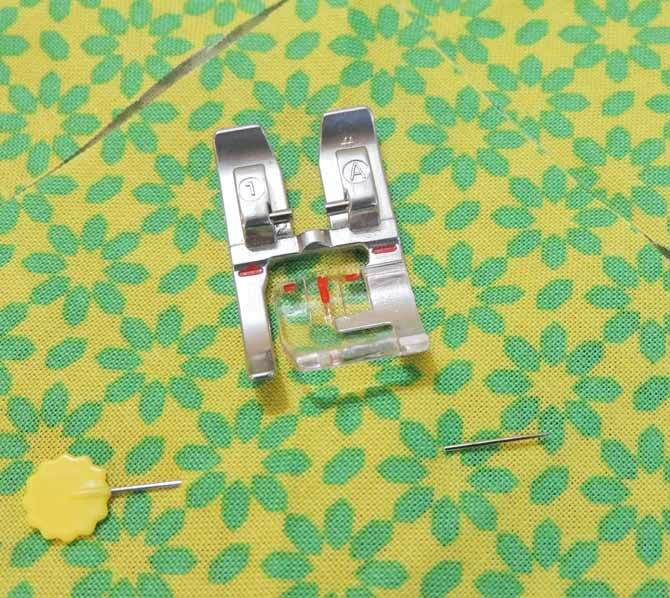 I use the needle down button so the needle is always in my fabric when I stop sewing and since I can trust it and the IDT system to feed my fabric evenly under the needle, I don’t use pins! I find myself only pinning now on long sides of projects – like sewing the rows of a quilt together – and that’s it! Press the seams away from the center row. Pin the hearts to the center of the topper. As you can see in the following pictures, there are two different options here – either line up the centers of the hearts with the centers of the side squares, or line them up with the center of the triangle sides. I lined mine up with the diagonal corners. I used one pin in each heart to keep them in place for machine blanket stitching. 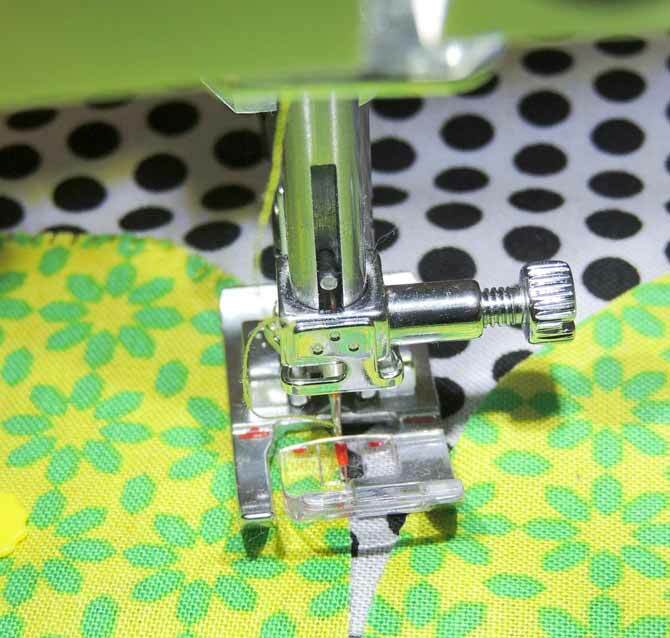 When you’re pinning the applique pieces in place, make sure they are secure but that there is enough room to move the presser foot easily around the pieces while stitching. Then I changed my top thread to a shade of green and chose stitch 27 on the passport 3.0 – the blanket stitch – to applique the hearts to the topper. By choosing the blanket stitch I know I need to change my presser foot too. When I pushed the “i” icon under the LED display, the display changed to show that the recommended presser foot for the blanket stitch is 1A. I attached the 1A presser foot and the IDT system was engaged! 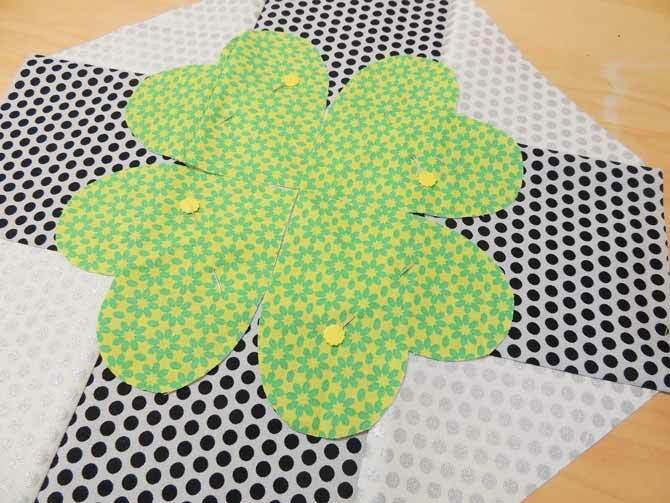 I love using the IDT system – it reassures me that my stitches will come out evenly which is really important to me when I’m using decorative stitches. I started stitching around the edge of the clover leaf, lining up the red guide on the foot with the edge of the green fabric. 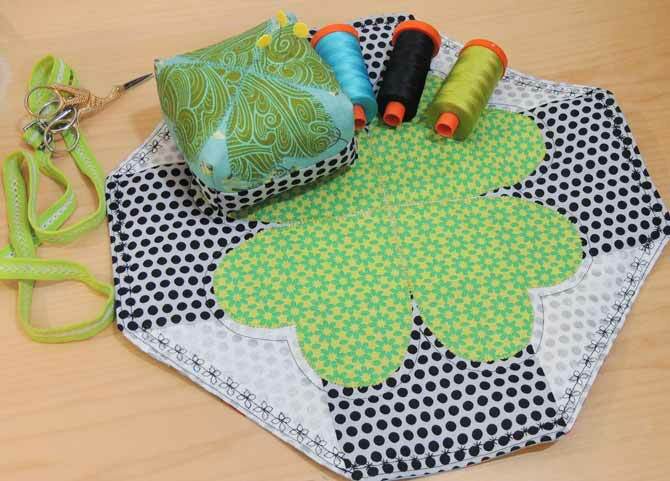 Using charm squares made quick work of putting together this table topper and the passport 3.0 helped me securely stitch the clover leaf in place. Come back tomorrow and we’ll finish the table topper together! Cute table topper! The instructions look great! Great instructions. I’ve not worked with charm squares. I’d love to try this out.